Six British & Irish Lions players have been inducted into the International Rugby Board Hall of Fame. Lions' Robert Seddon, David Bedell-Sivright, Bleddyn Williams, Jack Matthews, Ronnie Dawson and Gavin Hastings all got the nod in the ceremony held after the opening day of the inaugural IRB world conference in Dublin on Monday. Seddon was the first ever captain of the Lions and skippered the team back in 1888 while Williams and Matthews both turned out on the 1950 tour. Lions legend Gerald Davies picked up the awards on their behalf. Bedell-Sivright skippered the famous tourists in 1904 while Hastings was picked on three different times by the Lions. And Dawson led the Lions on three occasions in 1959. 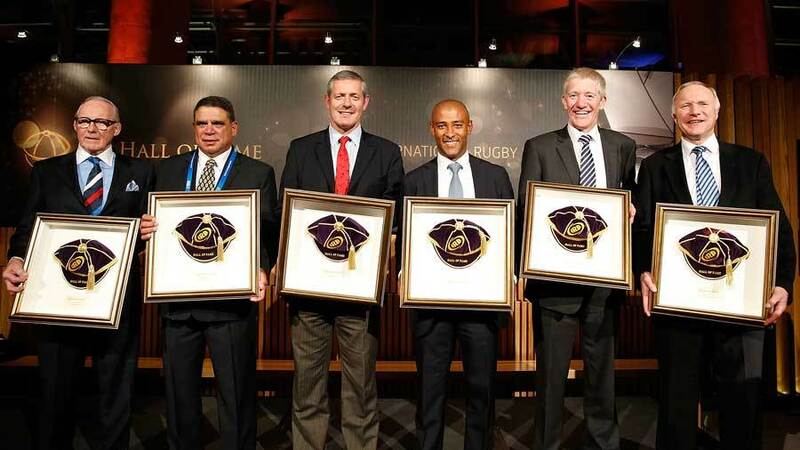 Alongside the six Lions, six former Wallabies were also inducted: George Gregan, David Campese, Ken Catchpole, Mark Ella, John Thornett and Tom Lawton. "The IRB Hall of Fame recognises those who have made an indelible mark on our sport through feats on the field of play, displays of great character or through their tireless and inspirational work in driving forward our great game," IRB Chairman Bernard Lapasset said. "The British & Irish Lions are an institution, a symbol of our history, our present and our future, and tours to Australia have delivered bountiful unforgettable memories. These inductees, legends in their own right, have stamped their own mark on this incredible piece of rugby history." Baron Pierre de Coubertin, Dr Danie Craven, Sir Wilson Whineray, Gareth Edwards, John Eales, The 1888 Natives Team and Joseph Warbrick, Ned Haig and the Melrose club, Dr Jack Kyle, Philippe Sella, Hugo Porta, William Maclagan, Barry Heatlie, Bennie Osler, Cliff Morgan, Sir Anthony O'Reilly AO, Frik du Preez, Dr. Syd Millar, Willie John McBride, Sir Ian McGeechan, Jean Prat, Lucien Mias, Andre and Guy Boniface, Serge Blanco, Harry Vassall and Alan Rotherham, Cardiff RFC and Frank Hancock, David Gallaher, Barbarian FC and WP Carpmael, Mike Gibson, Dr Roger Vanderfield, Richard Littlejohn, Sir Nicholas Shehadie, John Kendal-Carpenter, David Kirk, Sir Brian Lochore, Nick Farr-Jones, Bob Dwyer, Francois Pienaar, Kitch Christie, Rod Macqueen, Gareth Rees, Sir Clive Woodward OBE, Jonah Lomu, Jake White, Brian Lima, Agustín Pichot, Martin Johnson CBE, John Smit, Sir Gordon Tietjens, Ian & Donald Campbell, Yoshihiro Sakata, the 1924 Romanian Olympic Team, the gold medal-winning USA Olympic Team of 1920 and 1924, Richard and Kennedy Tsimba, Alfred St George Hamersley, Vladimir Ilyushin and Waisale Serevi.